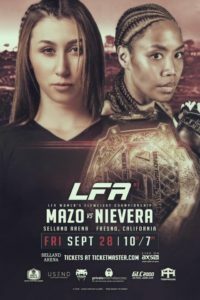 Undefeated Sabina Mazo (5-0) will put the LFA women’s Flyweight title on the line for the first time at LFA 51, against Jaimee Nievera (7-4). LFA 51 is set for September 28 at the Selland Arena in Fresno, California. Mazo from Medellin, Antioquia, Colombia, is 3-0 in LFA. At LFA 9 “The Colombian Queen” scored a head kick knock out of Jamie Thorton, and the same result came when Mazo, faced Linsey Williams at LFA 23. The 21 year old won became the 2nd LFA women’s Flyweight champion ever, defeating Shannon Sinn by unanimous decision at LFA 37. Nievera 33, is a vet of the LFA, Bellator MMA, & Dana White’s Tuesday Night Contender Series. A 3 fight win streak, that included a Bellator 183 decision win over Corina Herrera & a LFA 42 decision win over Katy Collins, saw “Queen Nie” earn a shot on Dana White’s Tuesday Night Contender Series. That opportunity didn’t go so well, as Antonia Shevchenko won by 2nd round TKO.